Friday, Oct. 19, 2018, 6 p.m. to 9 p.m.
Saturday, Oct. 20, 2018, 9 a.m. to 9 p.m. Enjoy a variety of Halloween inspired entertainment and ghoulishly sweet treats. Make your way through a Halloween haystack maze, be spellbound by the bewitching animated Dancing Light Show at its new location in the freaky, creaky forest behind the Small Mammals Building and watch spirited musical performances by Razzmatazz! Swoop into the Small Mammals Building and hear from zookeepers about the interesting variety of bats that call the Zoo home. Presentations take place both Friday and Saturday at 7 p.m. and 8 p.m. 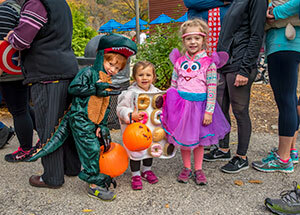 Magical “creatures” 12 and under, or groups and families with themed costumes can enter our Spooktacular Costume Contest! Registration is from 9 a.m. to 12:30 p.m. and winners will be announced during the after-parade festivities. All registered participants will be entered into a prize giveaway! Slip into your favorite Halloween attire and march in our annual costume parade Saturday at 2 p.m. The parade starts at the Northwestern Mutual Family Farm and ends at the Peck Welcome Center, where Shannen O. from FM 106 will announce the costume contest winners! If you’ve got a carving for pumpkins check out hundreds of glowing, hand-carved jack-o-lanterns throughout the Zoo grounds! Are you brave enough to board the Raven’s Rail? Take a seat and see the Zoo on the transformed North Shore Bank Safari Train. Trick or treat! Collect savory sweet treats by visiting treat stops located among our animal exhibits where volunteers will fill your bags with goodies galore! For our little ghosts and goblins with food allergies, we have a few allergy-free stops, courtesy of the Teal Pumpkin Project. Kids will receive Halloween wristbands, stretch snakes, spiders and more! Our animals will join in the Halloween spirit, receiving special pumpkins prepared with love just for them, filled with their favorite treats for an extra spooktacular enrichment! 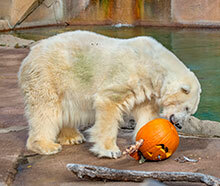 Some of the animals receiving pumpkin treats include tigers, hippos and polar bear, Snow Lilly. Zoological Society membership is valid for Halloween Spooktacular. Click here for a list of Frequently Asked Questions about Halloween Spooktacular. The Zoo is proud to offer a not-too-scary family-friendly Halloween experience for visitors of all ages! All activities are free with Zoo admission unless otherwise noted. For more information on this spooktacular event, please contact the Zoo at 414.256.5466.